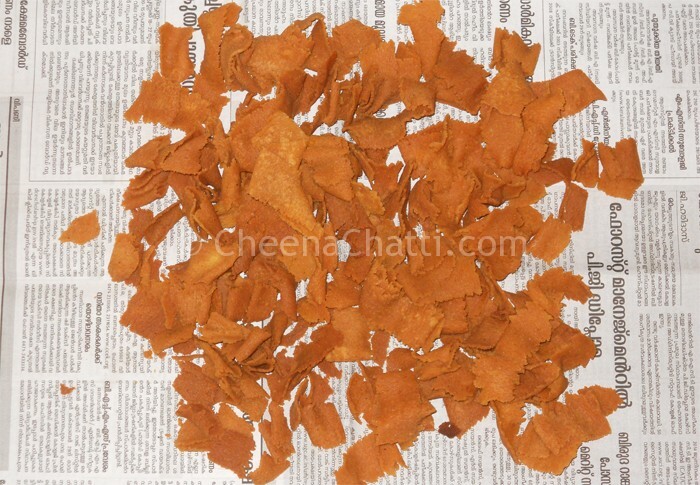 Pakkavada is a very popular Kerala snack item prepared from rice flour and besan. Its also known as ribbon pakoda due to its peculiar shape. Its most commonly served at tea time. Sift together the roasted rice flour, besan into a bowl. Add the ghee / melted butter, salt, chilly powder and the pepper powder to the bowl. Knead it into a smooth dough by adding water little by little. The consistency of the dough should be that for idiyappam or little looser than the one for chappathi. Change the disc of idiyappam mould / seva to the narrow slit like one for pakkavada / ribbon pakoda. Fill the mould with the dough. Heat oil in a deep fying pan and when it becomes hot, empty the seva to the hot oil in a circular motion. Fry the pakavadas until its golden colored. You can stir in between. Drain into a colander / kitchen towel. Fry the curry leaves and mix them with the pakavadas. Serve it hot with a cup of tea or you can store them for months in air tight containers too. Try this ribbon pakoda / pakkavada recipe and let me know your comments ;). Don't forget to try our other snack recipes also. How to prepare Kuzhalappam in Kerala style? This entry was added on November 5th, 2013 by Cini P Moideen in Bakery and tagged with ribbon pakkavada, evening snack, nadan snacks, evening kerala snack, kerala snacks, how to make pakkavada, pakkavada, indian pakkavada recipe, evening snacks. Last revised on April 4th, 2018.
thanks, it came out well and very tasty. Thanks for sharing the recipe. Thank you Sumathy for the feedback!